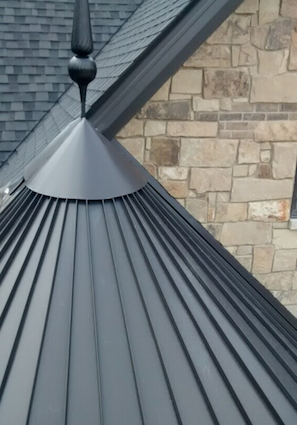 Reap the benefits of all that a metal roof has to offer with Bill Jackson Roofing's expert installation. Bill Jackson Roofing specializes in the installation, repair and replacement of metal roofs. By choosing a metal roof, you can save money while conserving energy and being more environmentally friendly. Metal roofs can also give you the look of other types of roofing materials without the disadvantages they often have. If you live in Elyria, Lorain, North Olmsted or any town or city nearby, contact us today for a free roofing quote. We look forward to discussing your roofing needs and creating the perfect roof for your home. Our roof replacement services are available all throughout the Northeast Ohio area, including North Ridgeville, Amherst, Grafton, Avon, Oberlin, Sheffield Lake, Lagrange and nearby!